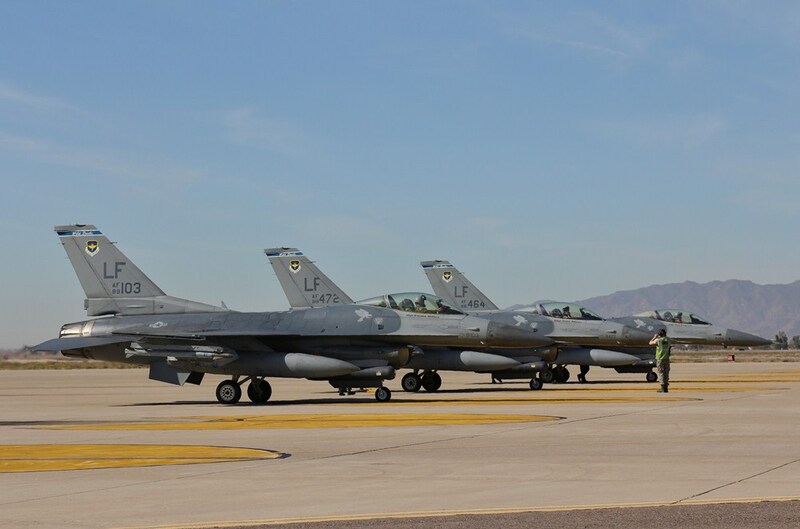 Here in Arizona and the “Valley Of The Sun”, we are very fortunate to have one of the largest training bases in the world, that turns out some of the best pilots in the US Air Force. 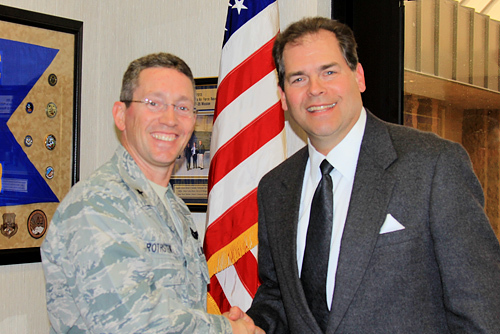 Recently, I had the high honor of interviewing 56th Fighter Wing/ Base Commander, Brig. 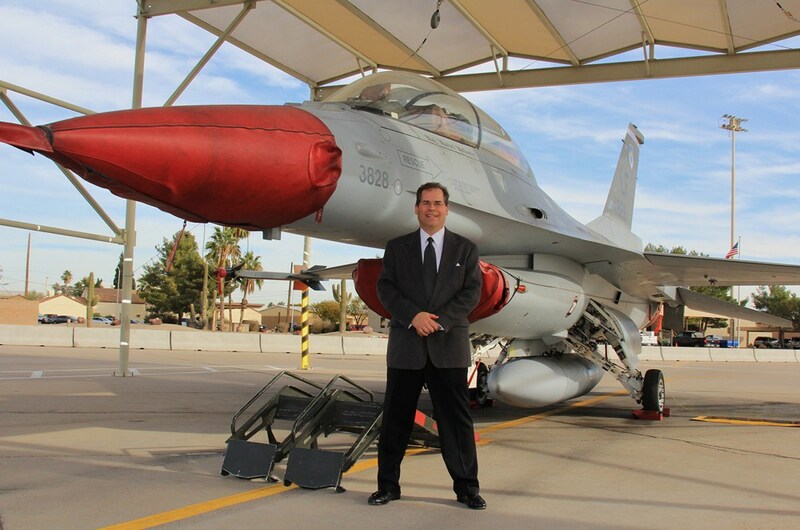 General Michael D. Rothstein .In this interview we discuss training with the F-16, the soon to arrive F-35A and the many exciting things that are happening at Luke AFB. Lt. Candice N. Dillitte/ Chief, Media Relations, for making all this happen! Luke Air Force Base is named for the first aviator to receive the Medal of Honor- Lt. Frank Luke Jr. Born in Phoenix in 1897, the “Arizona Balloon Buster” scored 18 aerial victories during World War I (14 of these German observation balloons) in the skies over France before being killed, at age 21, on Sept. 29, 1918. In 1940, the U.S. Army sent a representative to Arizona to choose a site for an Army Air Corps training field for advanced training in conventional fighter aircraft. The city of Phoenix bought 1,440 acres of land which they leased to the government at $1 a year effective March 24, 1941. On March 29, 1941, the Del. E. Webb Construction Co. began excavation for the first building at what was know then as Litchfield Park Air Base. Another base known as Luke Field, in Pearl Harbor, Hawaii, released its name when the base was transferred to the Navy in June 1941, and the fledgling Arizona base was called Luke Field at the request of its first commander, Lt. Col. Ennis C. Whitehead, who went on to become a lieutenant general as commander of Air Defense Command in 1950. The first class of 45 students, Class 41 F, arrived June 6, 1941 to begin advanced flight training in the AT-6, although only a few essential buildings had been completed. 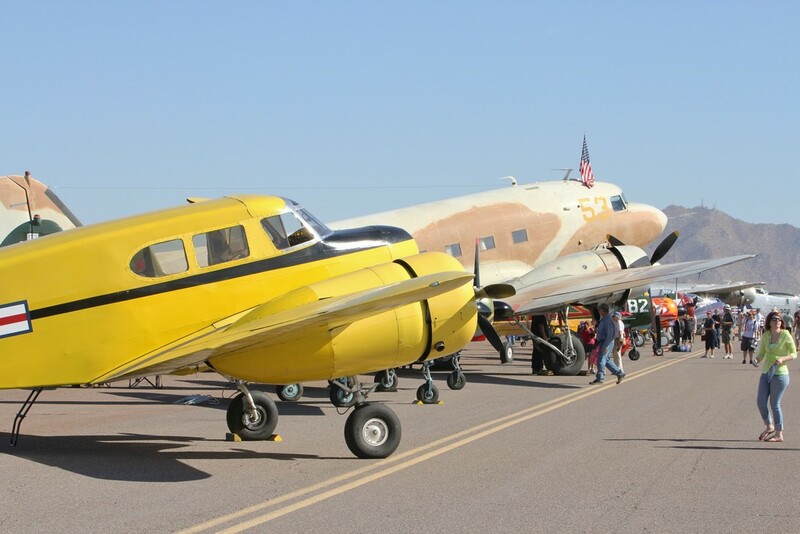 Flying out of Sky Harbor Airport until the Luke runways were ready, pilots received 10 weeks of instruction and the first class graduated Aug. 15, 1941. Capt. 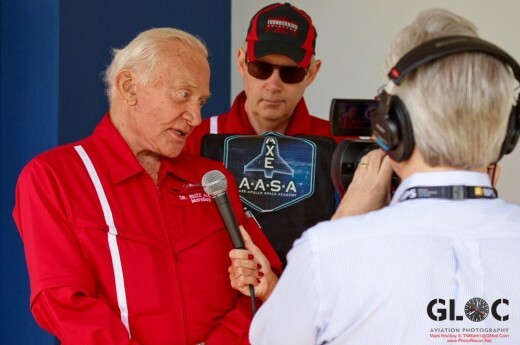 Barry Goldwater served as director of ground training the following year. During World War II, Luke was the largest fighter training base in the Air Corps, graduating more than 12,000 fighter pilots from advanced and operational courses in the AT-6, P-40, P-51 and P-38, earning the nickname, “Home of the Fighter Pilot.” By Feb. 7, 1944, pilots at Luke had achieved a million hours of flying time. 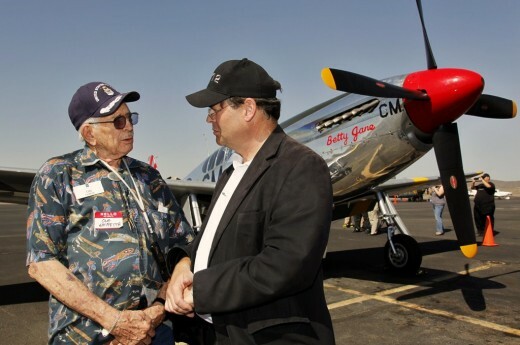 By 1946, however, the number of pilots trained dropped to 299 and the base was deactivated Nov. 30 that year. 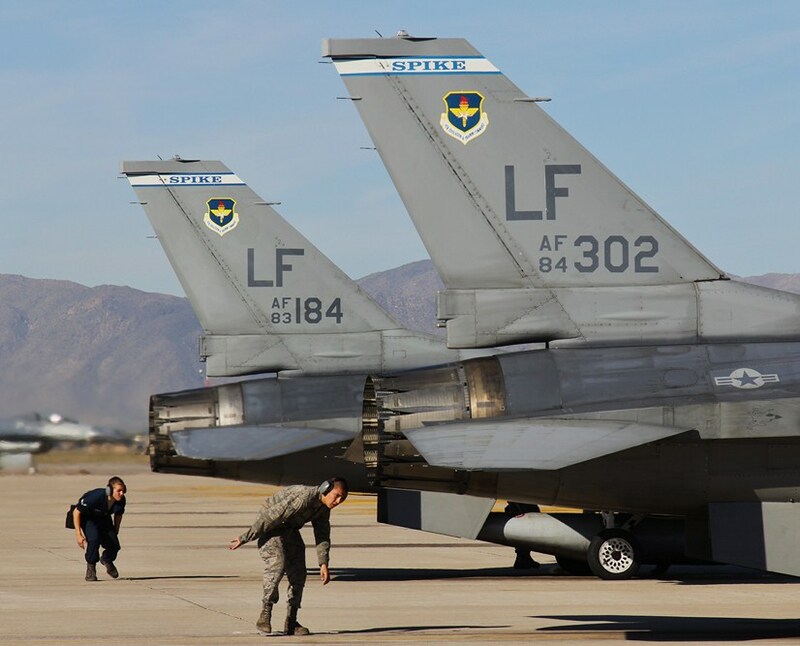 Soon after combat developed in Korea, Luke field was reactivated on Feb. 1, 1951 as Luke Air Force Base, part of the Air Training Command under the reorganized U.S. Air Force. Students progressed from the P-51 Mustang to the F-84 until 1964, then the F-104 Starfighter. Flying training at Luke changed to the F-100, and on July 1, 1958, the base was transferred from Air Training Command to Tactical Air Command. 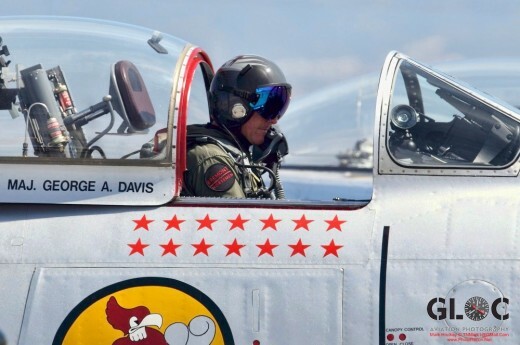 During the 1960s, thousands of American fighter pilots left Luke to carve their niche in the annals of Air Force history in the skies over Vietnam. In July 1971, the base received the F-4C Phantom II and assumed its role as the main provider of fighter pilots for Tactical Air Command and fighter forces worldwide. 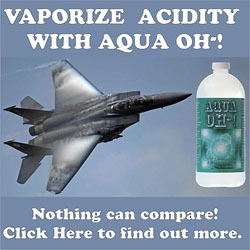 In November 1974, the Air Force’s newest air superiority fighter, the F-15 Eagle, came to Luke. 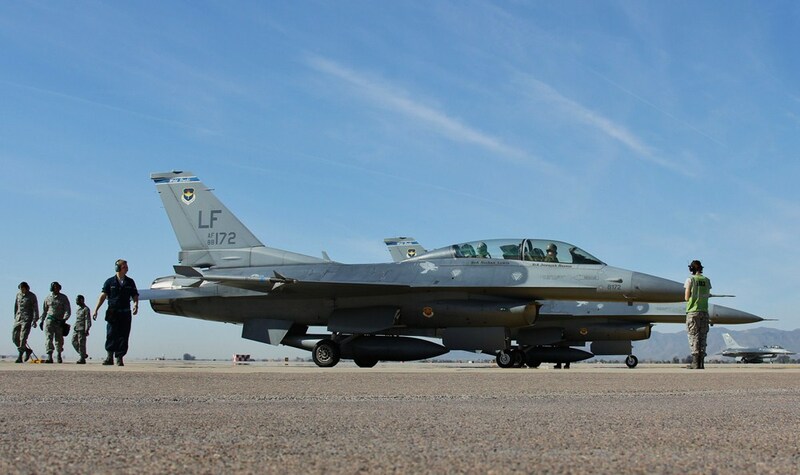 It was joined in December 1982 by the first F-16 Fighting Falcon, which officially began training fighter pilots Feb. 2, 1983. 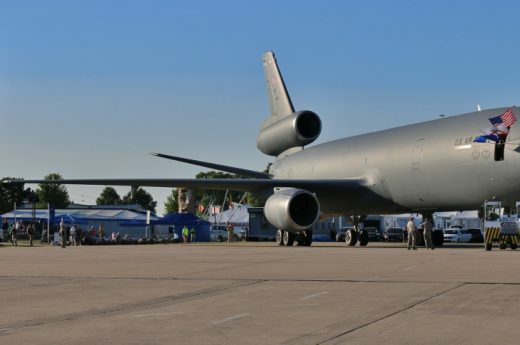 Luke units continued to set the pace for the Air Force. 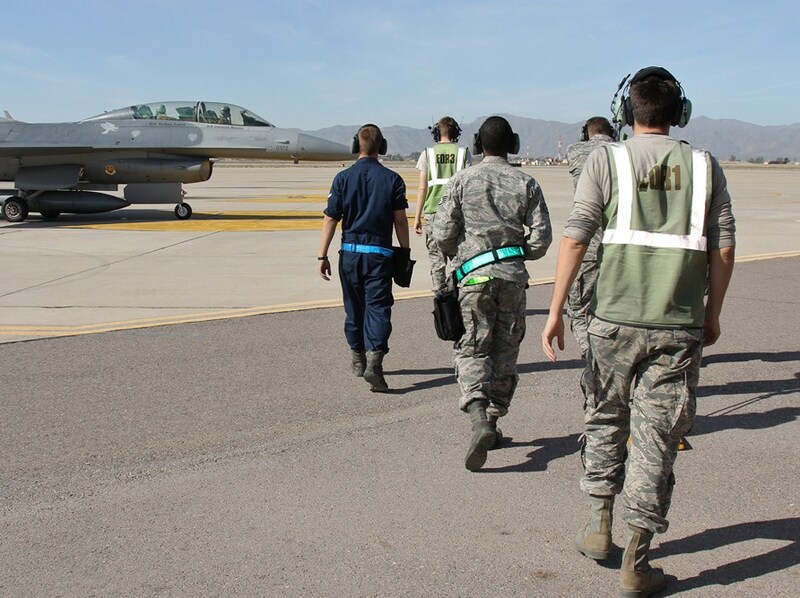 The 58th TTW had two squadrons – the 312th and 314th Tactical Fighter Training Squadrons – conducting training in the newest C and D models of the Fighting Falcon. 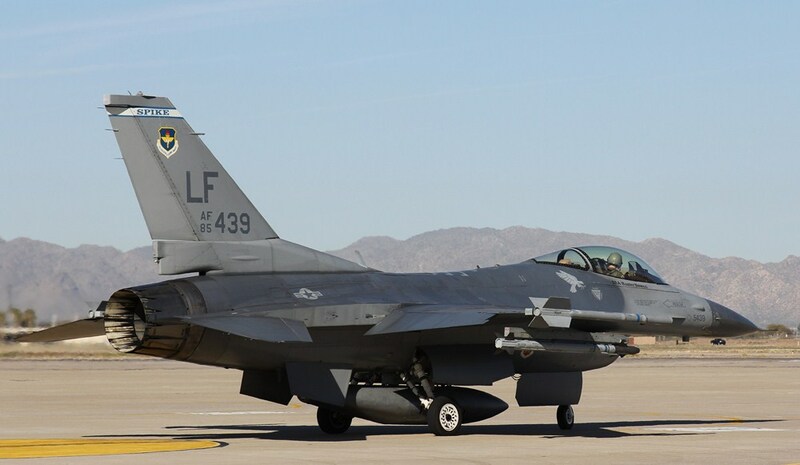 The 405th TTW received the first E model of the F-15 Eagle in 1988 and two of its squadrons – the 461st and 550th – began training in this dual-role fighter. 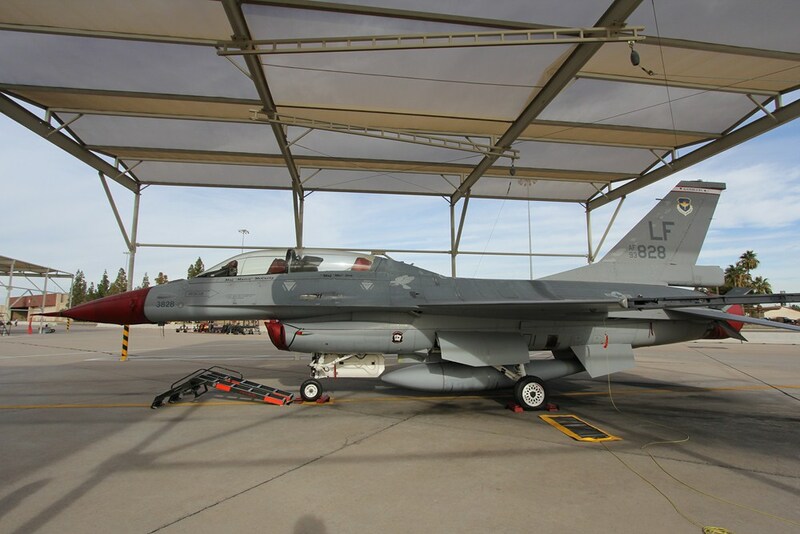 In July 1987, the Reserve function at Luke changed when the 302nd Special Operations Squadron deactivated its helicopter function and the 944th Tactical Fighter Group was activated to fly the F-16C/D. The early 1990s brought significant changes to the base. As a result of defense realignments , the 312th, 426th and 550th TFTSs were inactivated as were the 832nd Air Division and the 405th TTW. 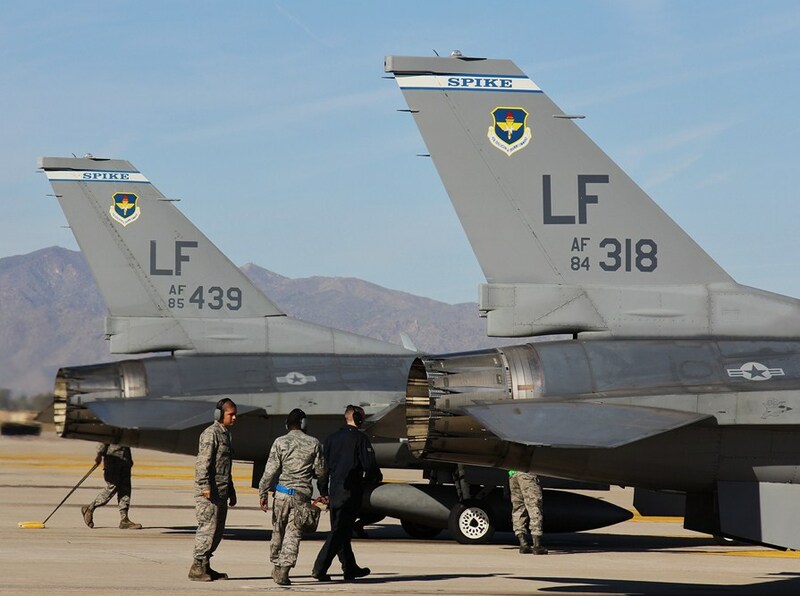 The F-15A and B models were transferred out, and the 58th TTW, being the senior wing at Luke, was re-designated the 58th Fighter Wing and once again became the host unit at Luke. 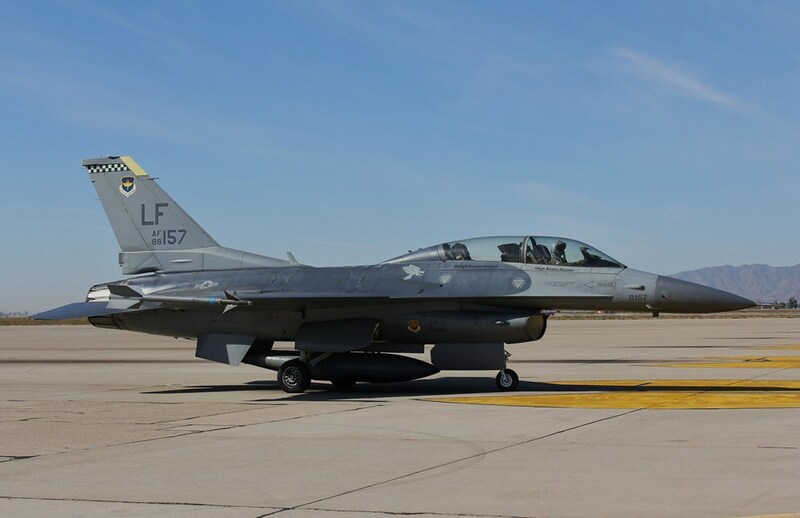 In April 1994, after 24 years at Luke, the 58th Fighter Wing was replaced by the 56th as part of the Air Force Heritage program. 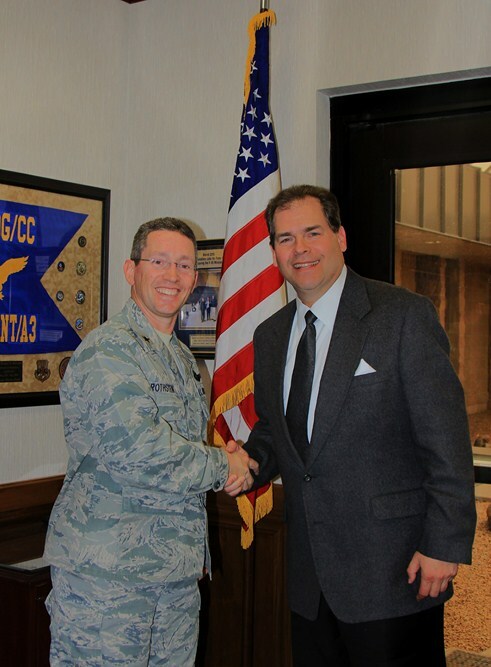 Air Force officials established the program to preserve the Air Force legacy and its history during the defense draw down. 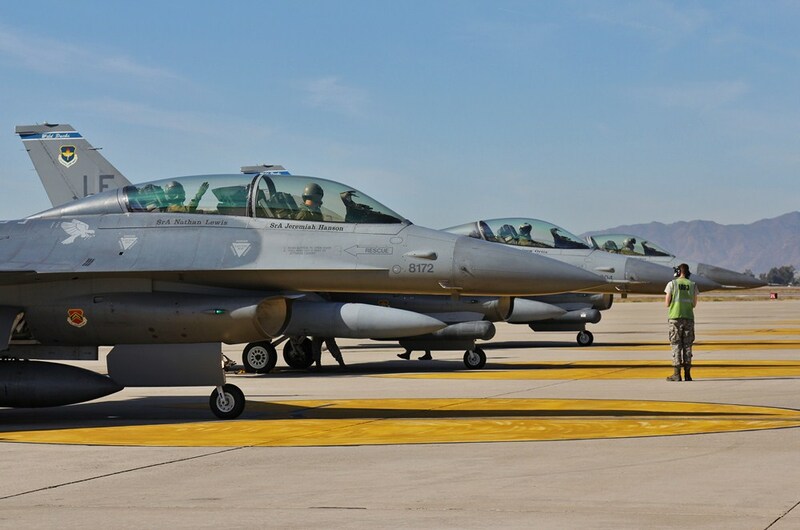 The 56th FW is one of the most highly decorated units in Air Force history. 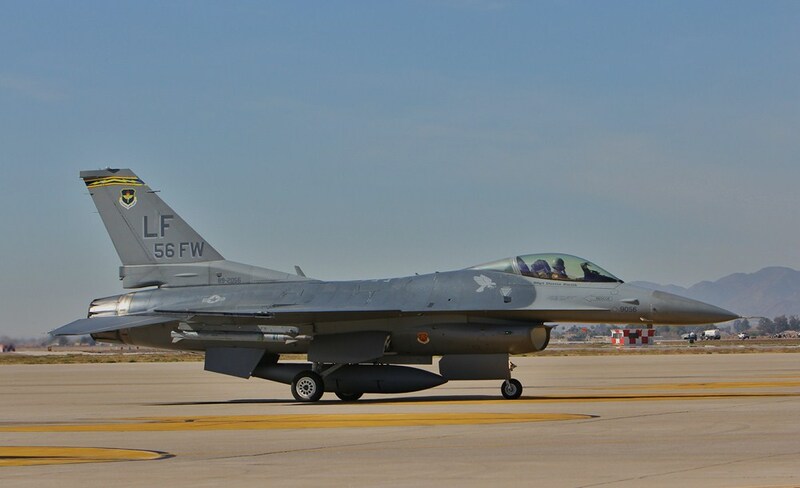 Units flying the F-16 Fighting Falcon are the 21st, 61st, 62nd, 308th, 309th, 310th, and 425th Fighter Squadrons. 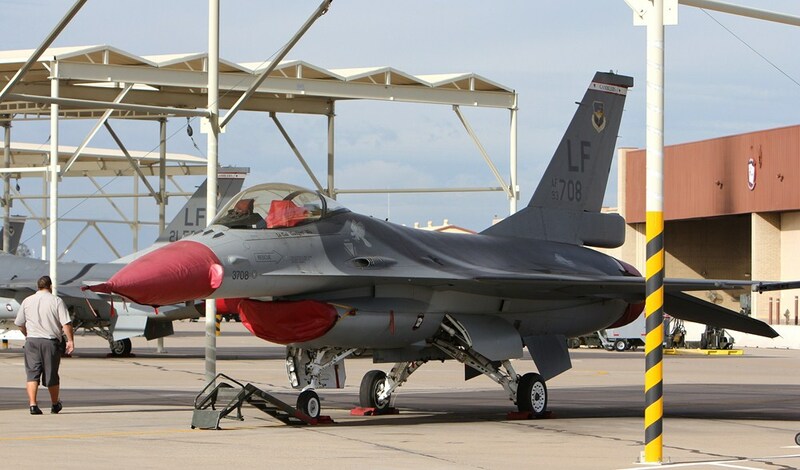 Luke is the largest and only active-duty F-16 training base in the world with over 135 F-16s assigned. 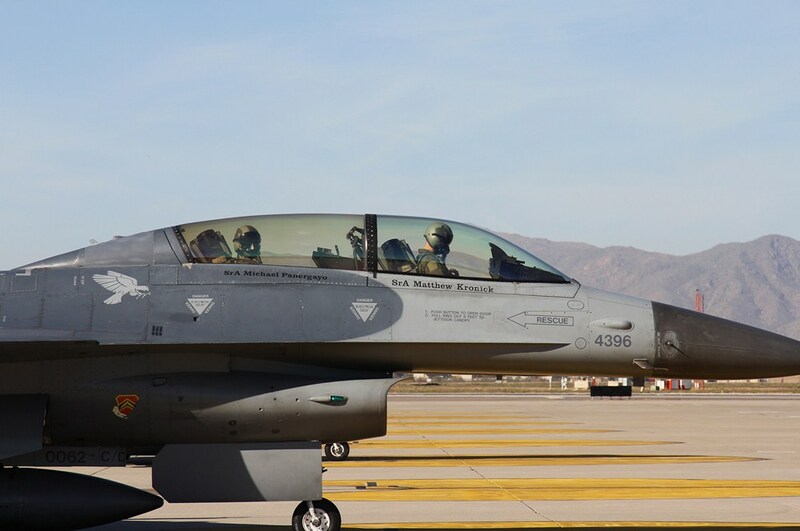 We trained more than 430 F-16 pilots last year many of whom are student pilots who came to this base straight from pilot school to receive intense training on the F-16. 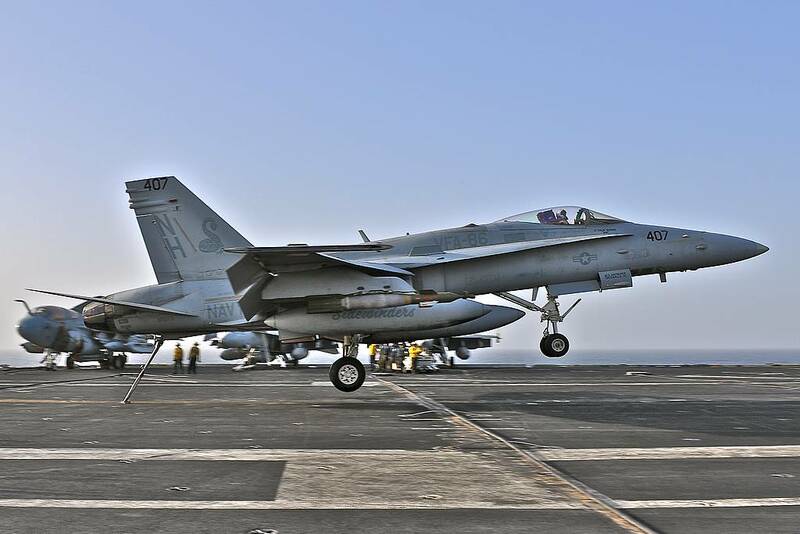 These pilots graduate from Luke and proceed to combat assignments throughout the world. 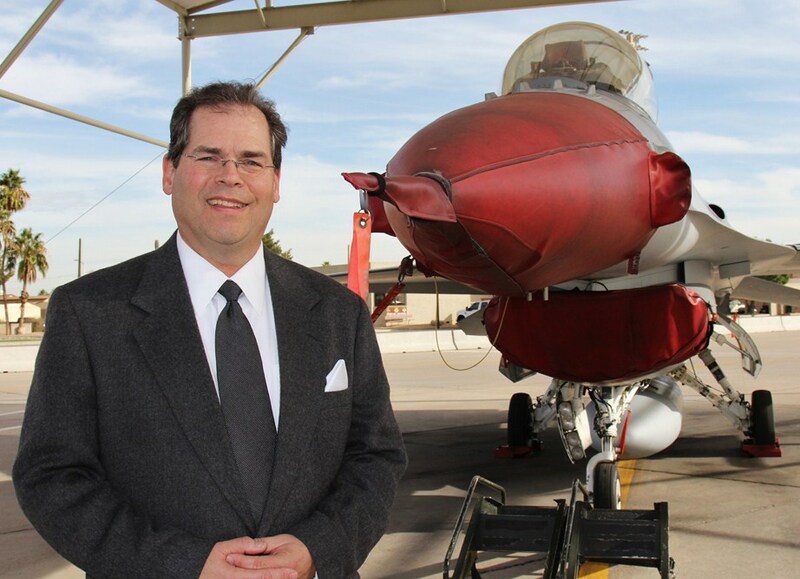 Luke conducts over 24,500 operations or over flights in its local airspace annually. Luke airmen are also deployed around the world in support of several contingency operations protecting U.S. interests abroad. 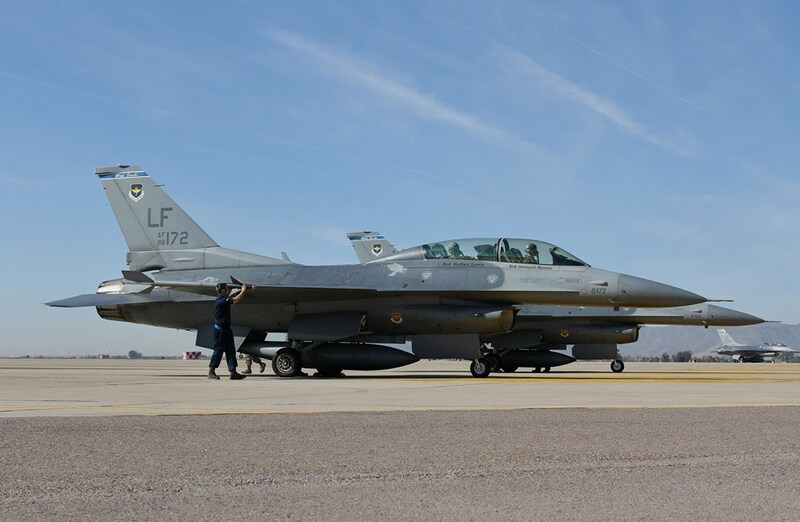 Luke AFB trains more than 50 percent of the USAF’s fighter force and 90 percent of its F-16 pilots. 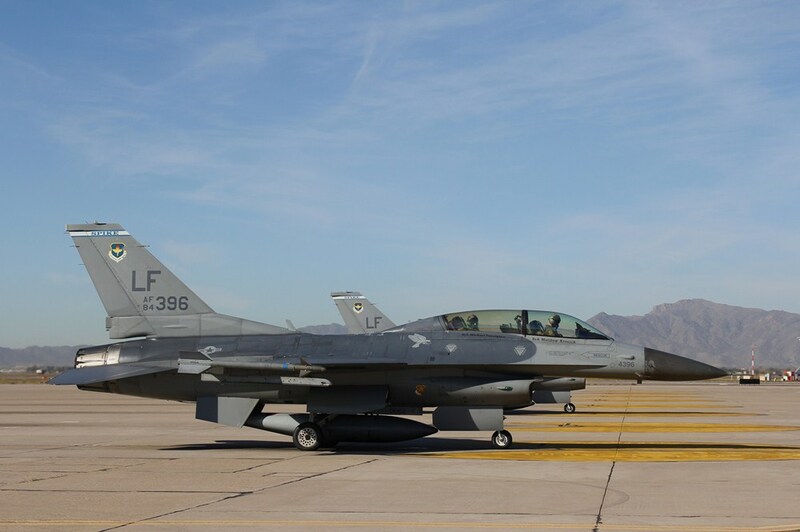 Nearly every F-16 pilot flying in Afghanistan and Iraq was trained at Luke AFB. 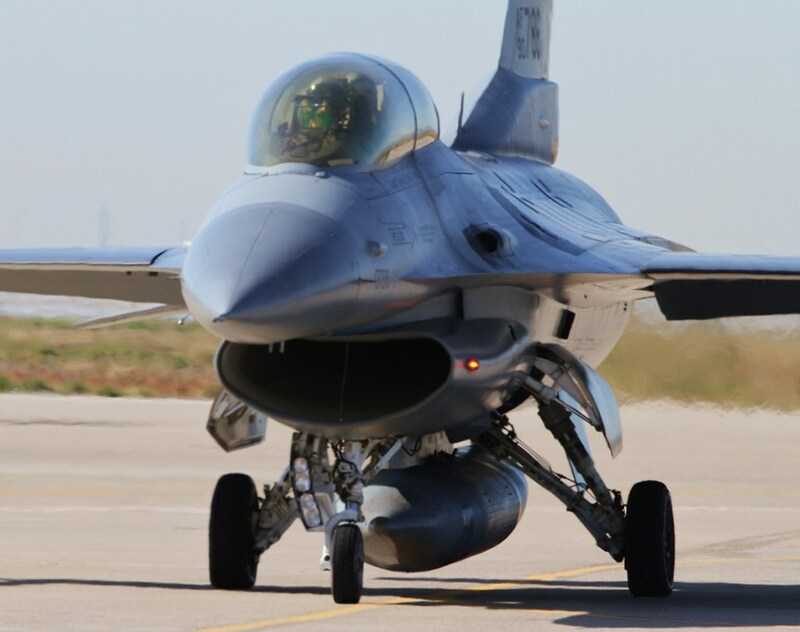 The F-16 represents the most fundamental form of Air Superiority, Global Attack, Rapid Global Mobility, and Precision Engagement. 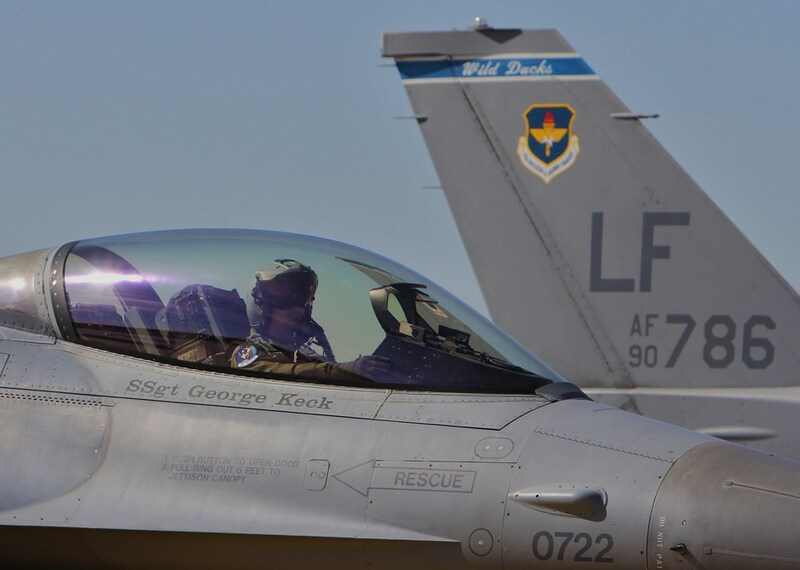 The pilots trained at Luke formed the backbone of USAF’s fighter force for Operations NOBLE EAGLE, ENDURING FREEDOM, and IRAQI FREEDOM. 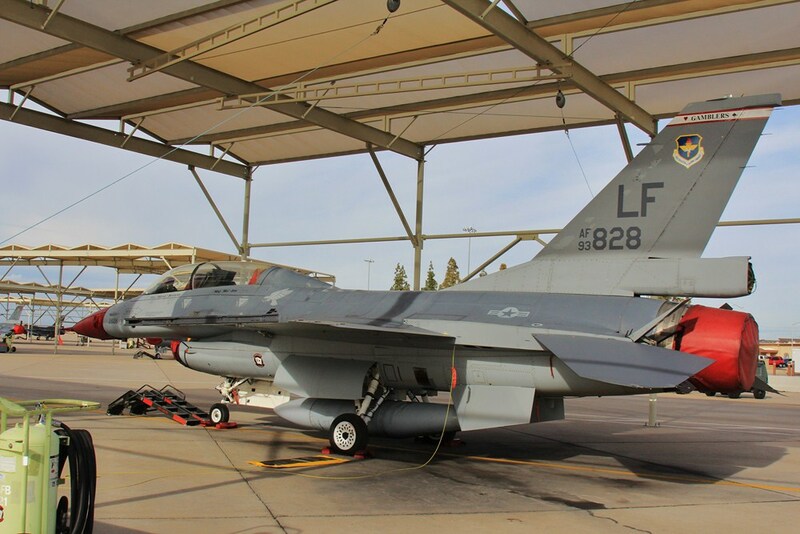 Luke Air Force Base is the largest fighter wing in the U.S. Air Force with 138 F-16s assigned. 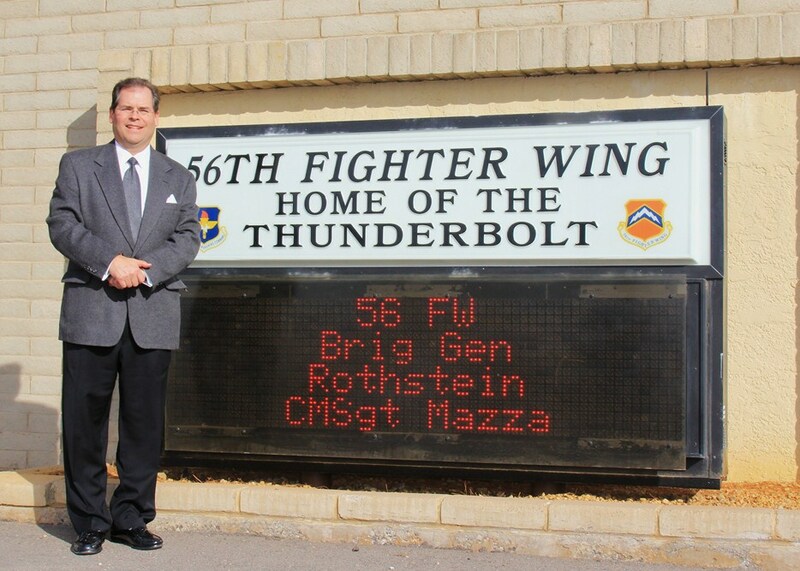 The host command at Luke is the 56th Fighter Wing, under Air Education and Training Command. 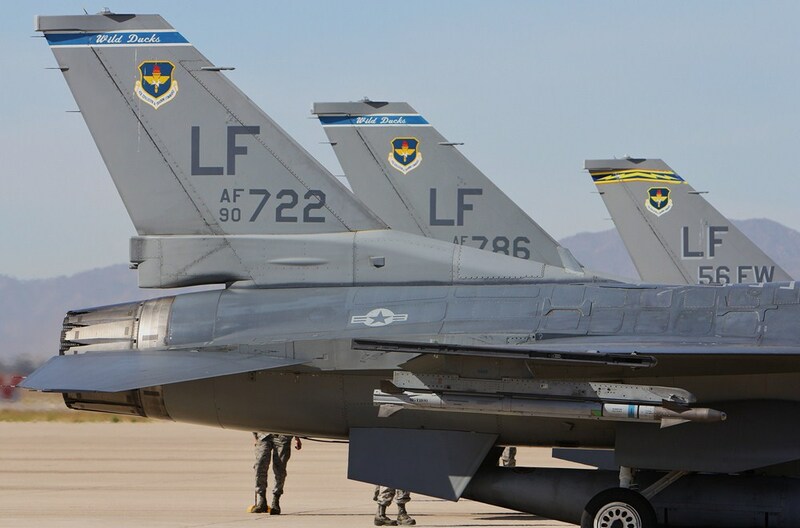 The wing is composed of four groups (and the Range Management Office), 24 squadrons, including six fighter squadrons. There are several tenant units on base, including the 944th Fighter Wing, assigned to 10th Air Force and the Air Force Reserve. 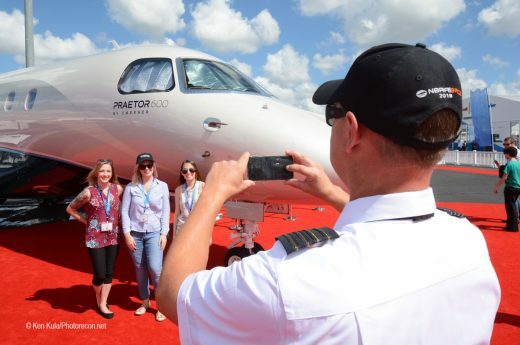 The base population includes about 4,830 military members and DoD civilians. 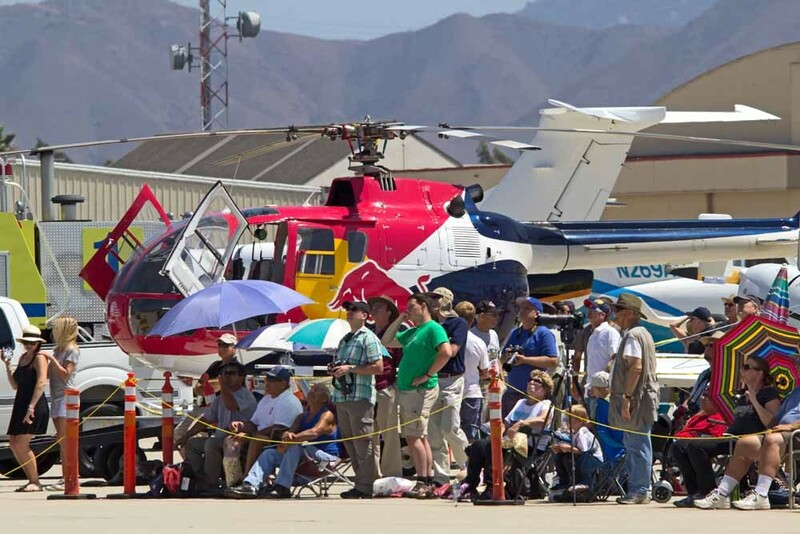 With about 70,000 retired military members living in greater Phoenix, the base services a total population of nearly 80,000 people. 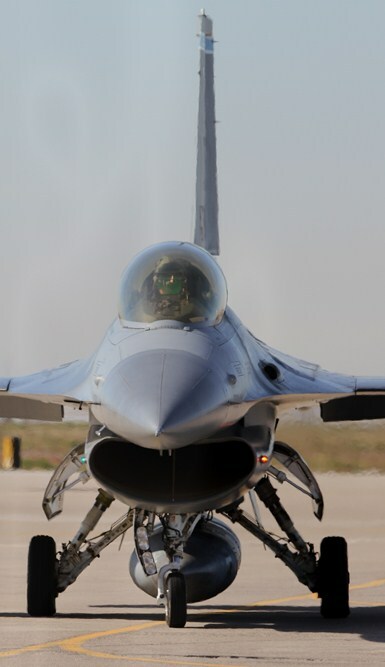 Approximately 300 pilots train at Luke annually and proceed to combat assignments throughout the world. 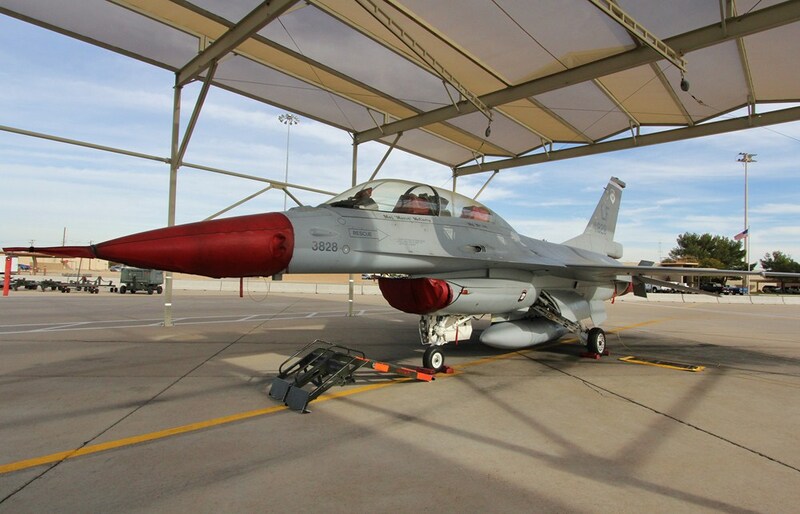 The 56th Fighter Wing also trains more than 350 maintenance technicians each year. 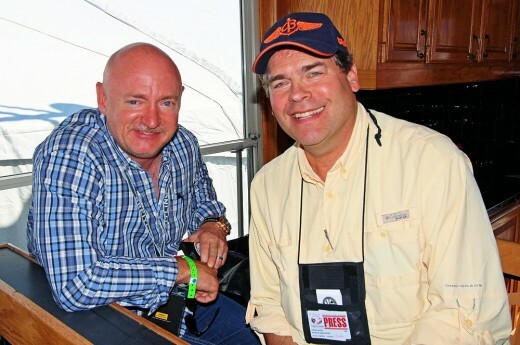 An integral part of Luke’s F-16 fighter pilot training mission is the Barry M. Goldwater Range. 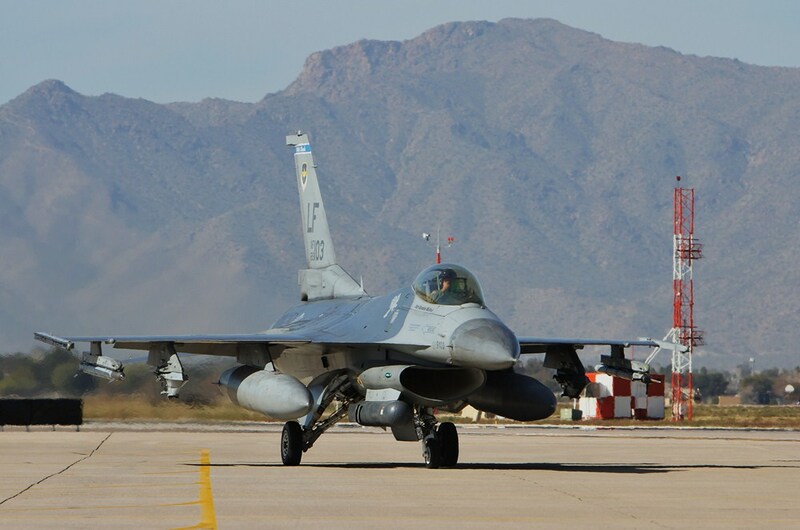 The range consists of 1.8 million acres of relatively undisturbed Sonoran Desert southwest of Luke Air Force Base between Yuma and Tucson south of Interstate 8. Overhead are 57,000 cubic miles of airspace where pilots practice air-to-air maneuvers and engage simulated battlefield targets on the ground. 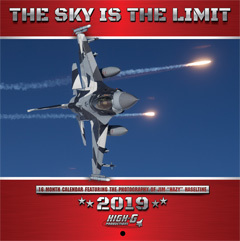 Roughly the size of Connecticut, the immense size of the complex allows for simultaneous training activities on nine air-to-ground and two air-to-air ranges. 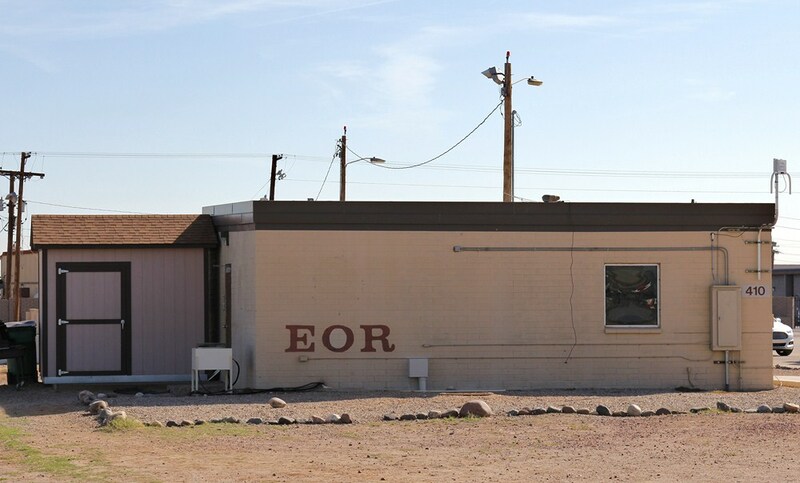 The Luke Air Force Base Range Management Office manages the eastern range activities and Marine Corps Air Station Yuma oversees operations on the western portion. 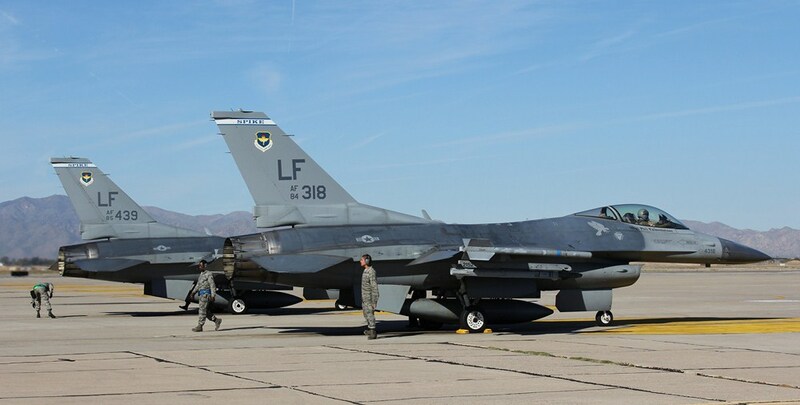 In addition to flying and maintaining the F-16, Luke Airmen also deploy to support on-going operations in Afghanistan and to combatant commanders in other locations around the world. 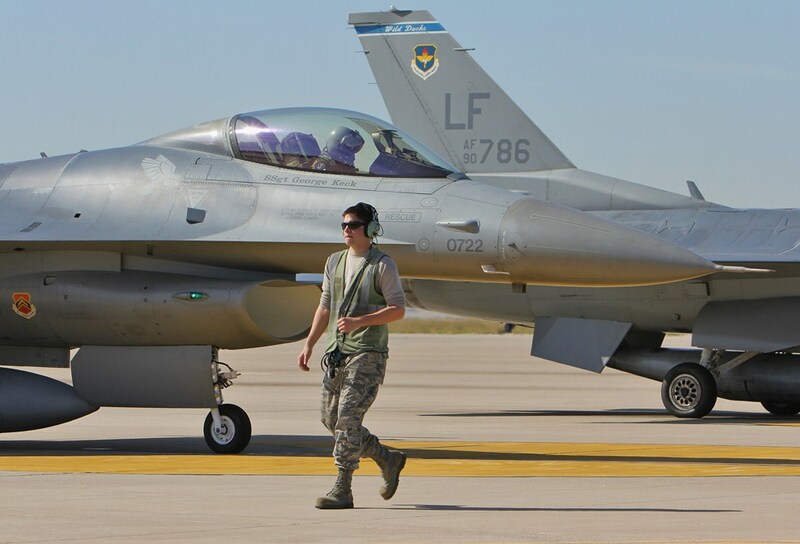 In 2012, more than 370 Luke Airmen deployed. 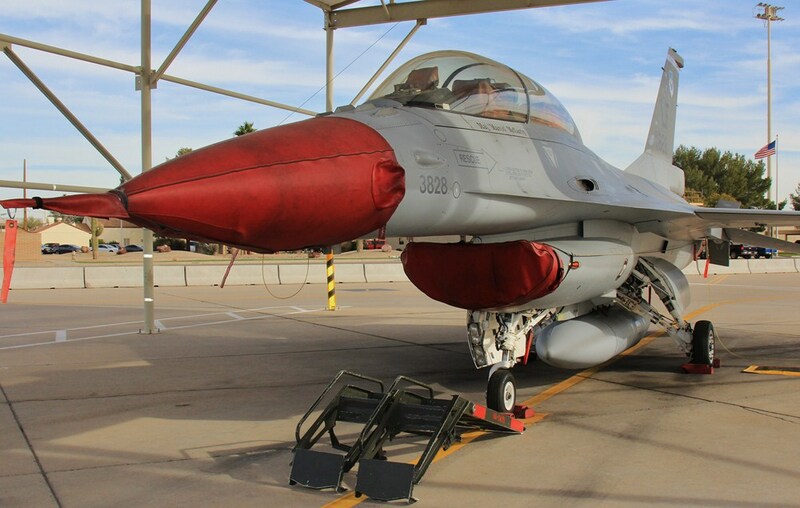 TThe 56th Fighter Wing, one of the most highly decorated aviation units in history, traced its history to the 56th Pursuit Group which first activated Jan. 15, 1941, at Savannah Air Base, Ga. The unit was redesignated a fighter group and equipped with the P-47 Thunderbolt when it was reassigned to England. The 56th flew its first combat missions of World War II on April 13, 1943. During its two-year involvement in the air war in Europe, the group damaged or destroyed 1,598.5 enemy aircraft. What seemed incredible was that the 56th posted that record while loosing only 25 fighters in aerial combat. The 56th also produced 39 fighter aces. After World War II, the 56th Fighter Group was assigned at Selfridge Field, Mich. 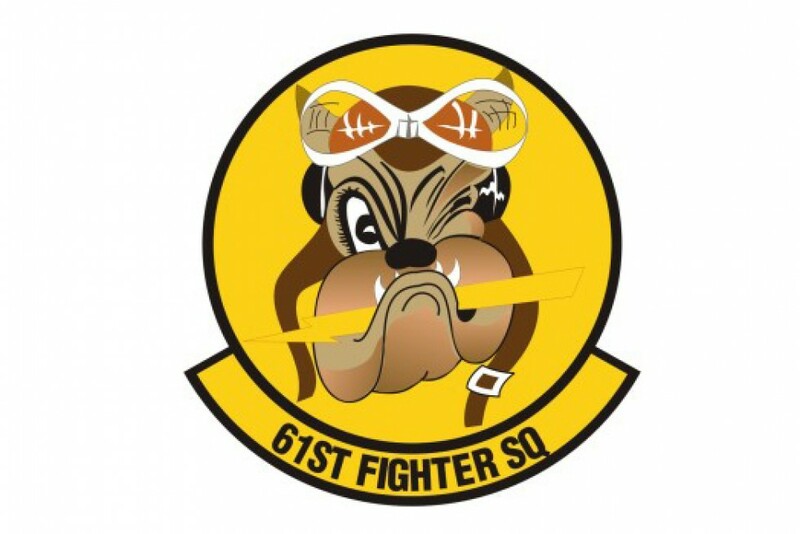 The 56th Fighter Wing was activated on Aug. 15, 1947, with the 56th Fighter Group as a subordinate unit. The wing’s mission was air defense. 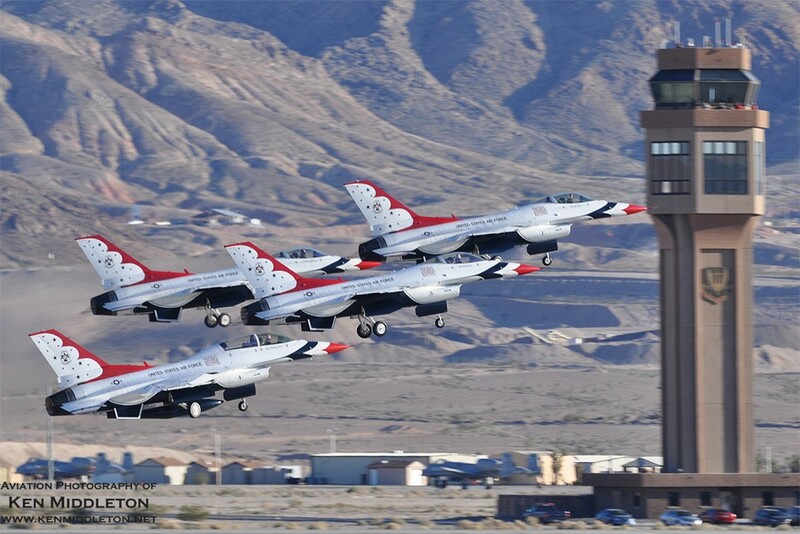 The unit wrote another chapter in aviation history July 14, 1948, when its F-80 Shooting Stars made the first ever west-to-east crossing of the Atlantic by military jets. The flight was a month after the Soviets set up their blockade of Berlin, and put the Soviets on notice that this nation had the capability to deploy a large package of military aircraft across the Atlantic in minimum time. The 56th was reassigned to Southeast Asia on March 16, 1967. While in Southeast Asia, the 56th not only supported but also conducted combat operations against an opposing armed enemy force. 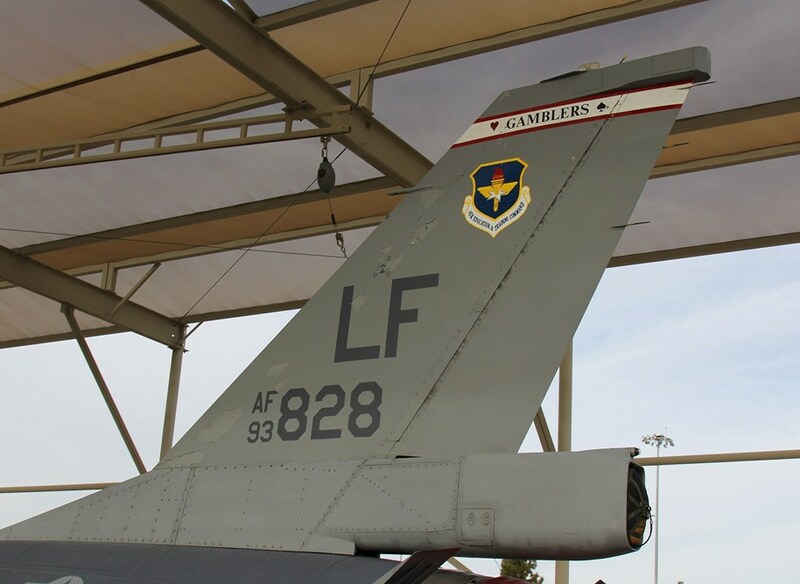 The wing was reassigned to MacDill AFB, Fla., on June 1, 1975, and conducted combat aircrew training in the F-4 and later fighter training in the F-16. 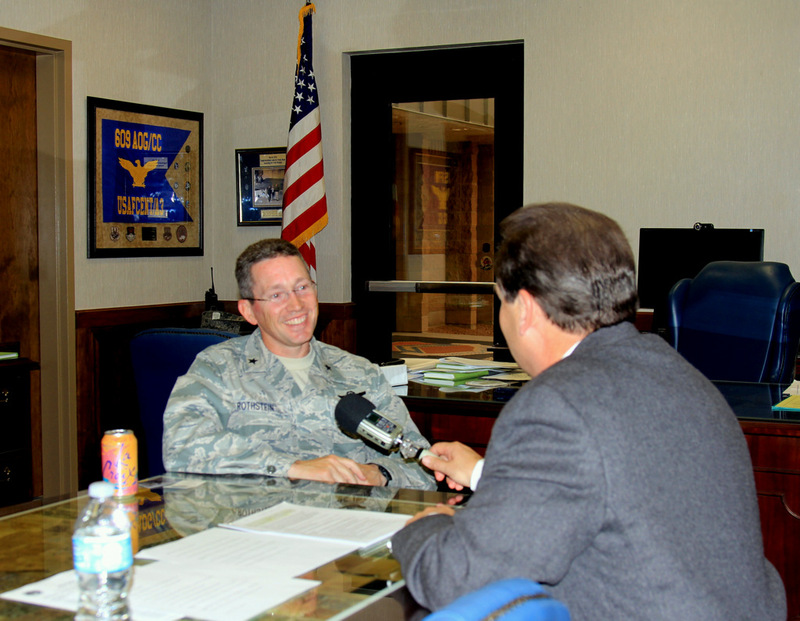 When MacDill AFB was named to close because of a general downsizing of the military due to the real-world political situation, the 56th was named to remain part of the active fighter force. 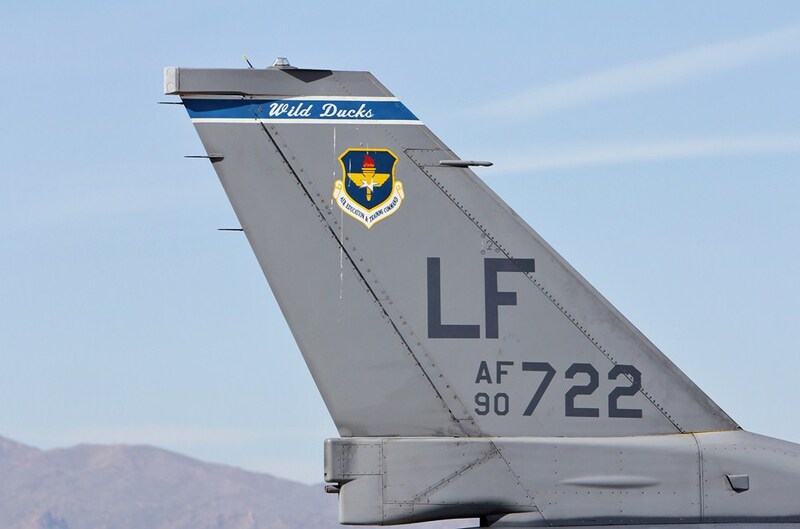 On April 1, 1994, the 56th Fighter Wing was reassigned to Luke AFB.